Health consultations over the telephone have advantages over face-to-face meetings, but are used less frequently. OH adviser Helen Rodway examines key themes in her award-winning research. Research suggests telephone consultations on health matters can provide a safe and efficient service while increasing patient satisfaction and case load management. They can reduce disruption and costs to providers, users and employers alike, yet to date patients are often denied this choice (Car J, Sheikh A, 2013; Nordal E et al, 2001; Pinnock H et al, 2007; Mair F, Whitten P, 2000; Thompson T et al, 2008; Warren J, Evans J, 2008; Gilmour E et al, 1998; May C et al, 2000; Ranson D et al, 2007; Smith S, Werren J, 2008). This article is based on my MSc research that won the Denis D’Auria prize at Cardiff University in 2013. The research carried out a study to analyse the potential advantages of the approach within OH, and was the first to review the literature on telephone consultations. Telephone consultations can potentially enhance access to the OH service for clients who are absent from work, returning to work, on rehabilitation programmes or have identified health concerns. They can be used to provide advice or receive information or updates from clients, reduce appointment waiting times, travel time and costs to clients and improve continuity and convenience of service. They could help reduce missed appointments, improve client satisfaction and offer a more timely service to employers with a reduced impact on productivity (Bluestone T, 2008). E-health – or healthcare practice supported by electronic processes and communication – is recognised as one of the most rapidly expanding areas of health provision, but it lacks a systematic research base. World Health Organisation (WHO) research concluded that e-health was secure and cost effective, and member states were encouraged to consider long-term strategic plans for it and to begin to develop infrastructures to support e-health evolution (WHO, 2005). Despite the support for e-health, the telephone has been overlooked in the search for more complex and faster broadband technology. Despite UK policy leads and increasing clinical interest, there remains a lack of evidence demonstrating either the real value or benefits in practice of telemedicine, (WHO, 2005; Miller E, 2007; Bend J, 2004) although the General Medical Services (GMS) contract does provide GPs with financial incentives to provide telephone access (Kainth A et al, 2003). Despite the limited evidence, the use of telephone consultations within OH is being adopted on a much wider corporate level. OH advice is given to small and medium-sized enterprises (SMEs) via telephone advice lines. However, evaluation of the Government’s Workplace Health Connect programme concluded that fewer calls were received than anticipated, with users preferring face-to-face support (Tyers C et al, 2009). The Welsh Assembly has published a 10-year strategy plan advocating the adoption of telehealth and e-health in a far more technological form than a basic telephone (Welsh Assembly Government, 2005). It also offers corporate OH via the Healthy Working Wales (Welsh Assembly Government, 2008) initiative with the pilot service Health at Work Advice Line Wales. The Government recently announced a health and work assessment and advisory service (HWAAS), which may include a telephone service. Telephone consultations exchange the costs and inconvenience of face-to-face consultations for the cheaper, quicker but riskier use of the telephone to consult over distances (Males T, 2007). Yet they are still subject to the same fundamental issues such as standards of care, patient confidentiality, data security, rights of access and duty of care, although some studies claim the duty of care is less (Norris A, 2002; Wootton R et al, 2006; Norris AC, 2001; Ferguson E, 2008). As healthcare professionals are accountable for any care they deliver, including via a telephone, they should ensure standards are in place that would meet the legal requirement of being “reasonable”. Standards will help protect against complaints and litigation (Royal College of Nursing, 2006; Randles Moscato S et al, 2007). The more diverse the role, the greater the need for medicolegal protection. This can be provided with agreed protocols, defined fields of practice and continuing professional development recognising nurse autonomy and legitimising nurses’ knowledge (Males T, 2007; Wootton R, 2006; DeSimone E, 2000; Harvey P et al, 2008). Telephone consultations are in use in a number of healthcare settings, yet I could find no examples in existing research involving OH. Telephone use does not require additional or specific training, ensuring it remains a tool for the patient’s consultation and not the focus of it (Davies J et al, 2006; Gingrich N et al, 2008) and the need for limited training may be a considerable benefit in ser-vice provision. If the convenience and accessibility of telephone consultations are examined in the context of multi-disciplinary, evidence-based protocols, telephone consultations potentially provide more good than harm. Any potential harm can be mitigated via provider training, robust protocols, quality audits and good communication skills. If offered as an alternative means of consulting, telephone consultations can enhance patient choice and empowerment. They can also facilitate a more rapid response to referral and can have less finan-cial impact in terms of time off work, commuting and parking for the patient. Following the literature review, I conducted an analytical study to collect data from a representative and unbiased sample of referrals to a university health centre. The quantitative data sought the views of service users in relation to the mode of service delivery and satisfaction levels. Additional data collected allowed exploration of any link between the mode of service delivery and patient satisfaction levels. The study team consisted of five OH nurse advisers based at two university OH centres, incorporating both student and OH services responsible for 6,085 staff (2,754 men and 3,331 women) and 27,000 students. All participants were informed of the study design regardless of the group to which they were assigned, to ensure that the study results were not influenced by one group having knowledge that was not available to the other. In the group using telephone consultation, individual cases were matched with controls by age, gender and the reason for referral. Participants were initially randomly assigned to either group and later recruits were specifically matched with a corresponding case or control. People with hearing or speech difficulties, no access to a telephone or personal computer within their normal working day or with severe psychiatric illnesses were excluded from the study. The questionnaire was delivered from within the Bristol on-line surveys (BOS) programme, with participants using the internet. Following initial construction of the questionnaire, the OH and administrative team assessed the validity of its content. The completed questionnaires assessed service users’ satisfaction by focusing on the domains of interaction, trust, and confidentiality and the consultation. After a pilot, the study was undertaken between 2009 and 2010 with 100 participants. Some 164 people were eligible for inclusion in the study, although disproportionately more females were referred to OH during the research period (see table 1). From the 164 eligible referrals, 100 (61%) agreed to participate. Table 2 shows that the combined study group comprised 30 men and 70 women, their age range being 27 to 64 and 25 to 64 respectively (mean 43.0 and 44.9 years). The OH advisers did not identify teleconsultations as being detrimental to any participant and therefore did not remove any participant from the study, although one patient from the telephone group died while taking part. No participants withdrew from the consultation phase of the study. Anonymous questionnaires were administered either at patient discharge or at six months following referral, whichever was the sooner. Of the 65 people who declined to take part in the full study, 29 (40%) consented to provide their reasons. Of these, 16 (64%) were opposed in principle to telephone consultations. Table 3 shows the future preferences of the 77 questionnaires received for analysis – 43 (55.8%) from the standard face-to-face group and 34 (44.2%) from the telephone consultation group. Table 4 shows some of the factors influencing future choice. Service users’ perceptions of the provider/patient relationship were evaluated in a series of questions for each of the two consultations. For the majority of the questions, there were no significant differences in the patients’ evaluations of face-to-face consultations and teleconsultations, reflecting research already in the public domain (Car J, Sheikh A, 2003; Nordal E et al, 2001; Gilmour E et al, 1998; Males T, 2007; Hargrave G et al, 2008; Varkey P et al, 2008; Williams M et al, 2008; Pinnock H et al, 2003; Lovell K et al, 2006). Statistical analysis identifies differences between the two groups in relation to disclosure, privacy concerns and distraction. Chi-square and Fisher’s exact test (a statistical significance test used in the analysis of contingency tables) showed that significant satisfaction differences are evident between face-to-face and telephone consultations. When given a choice, statistically, significantly more service users would choose face-to-face consultations. Table 4 highlights additional differences within embarrassment, anxiety and lesser differences within clarity, rapport and understanding. This may be a result of the lack of sensitivity inherent within non-parametric statistical techniques (statistics that do not assume the data or population have any characteristic structure or parameters). Results are based on responses from a single health centre and can be generalised to other settings only with caution. Patients and advisers were aware that they were part of a study and may have modified both their behaviour and responses accordingly. The length of the study was determined by academic restrictions and was therefore relatively short. A longer study would have been able to analyse patient satisfaction over time, thereby discounting the potential novelty bias that telephone consultations may have produced. Similarly, this study was restricted to patient satisfaction, excluding the perceptions of the line managers or OH advisers and did not identify or investigate the relationship between the mode of service delivery and the time taken to achieve a full return to work. Although telephone consultations do not appear to adversely affect patient satisfaction, there is no evidence to support or dispute their effectiveness. Furthermore, the study did not address cost analysis or workload impact in light of research identifying that telephone consultation participants are 50% more likely to re-consult in the short term, increasing the demand for consultations and related workload (Pinnock H et al, 2003; Pinnock H et al, 2005). It does, however, provide an addition to the very small evidence base for the acceptability of telephone consultations within an OH setting. Although the overall study has not proved to be statistically significant in each element, it has identified areas of statistical difference between the two modes of service delivery. Research in the public domain claims that telephone participants are likely to re-consult up to 50% more than face-to-face participants, which may affect service users’ satisfaction levels and service efficacy. In the light of the continued progression of technology, alongside recent and anticipated spending review implications, it is evident that further comprehensive research to examine the issues raised in this study is needed. This might clarify the role of telephone consultations within an OH setting, and identify what is needed if they are to develop as a means of service provision satisfactory to both service users and providers. when given a choice, a significant number of service users would choose face-to-face consultations. Bend J (2004). Public Value and e-Health. London: Institute for Public Policy Research. Bluestone T (2008). “Guidelines for telephone consultations”. Basildon and Thurrock NHS Trust. Car J, Sheikh A (2003). “Telephone consultations”. British Medical Journal; vol.326, pp.966-969. Davies J, Trude B, McConnell H, Ramirez R, Shields T et al (2006). “Improving health, connecting people: the role of ICTs in the health sector of developing countries – A framework paper”. Washington: infoDev. DeSimone E (2000). What should I document after a patient consultation? Ferguson E (2008). “Commentary on telephone consults”. Telemedicine Journal & E-Health; vol.14, issue 7, pp.726-727. Department of Health. 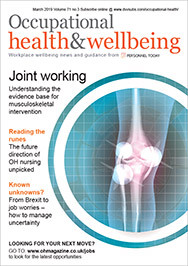 “Fitness for work: the government response to ‘Health at work – an independent review of sickness absence'”. London: TSO, 2013. Gilmour E, Campbell S, Loane M, Esmail A, Griffiths C, Roland M et al (1998). “Comparison of teleconsultations and face-to-face consultations: preliminary results of a United Kingdom multicentre teledermatology study”. British Journal of Dermatology; vol.139, pp.81-87. Gingrich N, Boxer R, Brooks B (2008). “Telephone medical consults answer the call for accessible, affordable, and convenient healthcare”. Telemedicine Journal & E-Health; vol.14, issue 3, pp.215-223. Hargrave G, Hiatt D, Alexander R, Shaffer I (2008). “Help is on the line. Telephone-based counselling is just as effective as face-to-face service”. Behavioural Healthcare; vol.28, issue 11, pp.20-23. Harvey P, Katz H, Kaltsounis D, Halloran L, Mondor M (2008). “Patient safety and telephone medicine: some lessons from closed claim case review”. Journal of General Internal Medicine; vol.23, issue 5, pp.517-522. Kainth A, McDaid C, Glanville J, Wright K, Toon P et al (2003). “Telephone consultations in primary care: a scoping review”. London: Department of Primary Care and Population Sciences. Liddell A, Adshead S, Burgess E (2008). “Technology in the NHS”. London: The King’s Fund. Lovell K, Cox D, Haddock G, Jones C, Raines D, Garvey R et al (2006). “Telephone administered cognitive behaviour therapy for treatment of obsessive compulsive disorder: randomised non-inferiority trial”. British Medical Journal; vol.333, issue 883. Mair F, Whitten P (2000). “Systematic review of studies of patient satisfaction with telemedicine”. British Medical Journal; vol.320, pp.1,517-1,520. Males T (2007). Telephone Consultations in Primary Care. London: RCGP. May C, Mort M, Mair F, Ellis M, Gask L (2000). “Evaluation of new technologies in healthcare systems: what’s the context?”. Health Informatics Journal; vol.6, pp.67-70. Miller E (2007). “Solving the disjuncture between research and practice: Telehealth trends in the 21st century”. Health Policy; vol.82, pp.133-141. Nordal E, Moseng D, Kvammen B, Lochen M (2001). “A comparative study of teleconsultations versus face to face consultations”. Journal of Telemedicine and Telecare; vol.7, pp.257-265. Norris A (2002). Essentials of Telemedicine and Telecare. West Sussex: John Wiley and Sons. Norris AC (2001). “The strategic support of telemedicine and telecare”. Health Informatics Journal; vol.7, pp.81-89. Pinnock H, Bawden R, Proctor S, Wolfe S et al (2003). “Accessibility, acceptability, and effectiveness in primary care of routine telephone review of asthma: pragmatic, randomised controlled trial”. British Medical Journal; vol.326, pp.477-479. Pinnock H, Gaskin S, Harris J, Snellgrove C, Aziz S (2007). “Accessibility, clinical effectiveness, and practice costs of providing a telephone option for routine asthma reviews; phase IV controlled implementation study”. British Journal of General Practice; vol.57, issue 542, pp.714-722. Pinnock H, McKenzie L, Price D, Sheikh A (2005). “Cost-effectiveness of telephone or surgery asthma reviews: economic analysis of a randomised controlled trial”. British Journal of General Practice; vol.55, issue 511, pp.119-124. Randles Moscato S, Valanis B, Gullion C, Tanner C, Shapiro S, Izumi S (2007). “Predictors of patient satisfaction with telephone nursing services”. Clinical Nursing Research; vol.16, pp.119-137. Ranson D (2007). “Telemedicine and the law”. Journal of Law and Medicine; vol.15, issue 3, pp.356-359. Royal College of Nursing (2006). “Telephone advice for people with long-term conditions”. London: Royal College of Nursing. Smith S, Werren J (2008). “Public expectations of health professionals when patients telephone for medical advice”. Journal of Law and Medicine; vol.16, issue 1, pp.57-73. Thompson T, Arthur D, Boxer R (2008). A model for telephonic medical consults. Tyers C, Lucy D, Carta E, Savage J, Kossykh Y, Bailey T (2009). “Workplace health connect evaluation findings”. Norwich: Institute of Employment Studies 2009. Varkey P, Schumacher K, Swanton C, Timm B, Hagen P (2008). “Telemedicine in the work site: a study of feasibility and patient provider satisfaction”. Journal of Telemedicine and Telecare; vol.14, issue 6, pp.322-325. Warren J, Evans J (2008). “A new way for GP appointments”. British Journal of Healthcare Assistants; vol.2, issue 2, pp.89-90. Welsh Assembly Government (2005). “Designed for life: Creating world-class health and social care for Wales in the 21st century”. The Strategy Department; Cardiff. Welsh Assembly Government (2008). Health at Work Advice Line Wales. Williams M, Amin A, Getgood A, Hallam P, Chojnowski A, Chapman P (2008). “Telephone clinic follow-up following carpal tunnel decompression”. Journal of Hand Surgery; vol.33, issue 5, pp.641-644. Wootton R, Craig J, Patterson V, editors (2006). Introduction to telemedicine. (2nd ed.) London: Royal Society of Medicine Press Ltd.
World Health Organisation (2005). Global eHealth Survey. Geneva: WHO. World Health Organisation (2005). Global Observatory for eHealth (GOeH). WHO.